One of the things that I love about going to Robinsons Supermarket is the Herbs Section. Even when I am not adept at using them in my dishes, I see to it that I get a pack or two every time I visit. I also love browsing through the display of different herb variety, thinking of where I can use them if ever I thought of buying. I usually get a pack of spinach I would saute with butter for a tasty veggie dish. 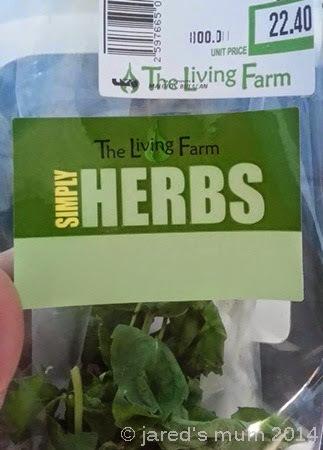 It was timely that I was able to scout these fresh herbs during our last visit, I was making lemon-infused water at the time and I chanced upon this recipe online that required a bunch of fresh mint. I got the smallest pack from the display rack as I will only be needing a small bunch. 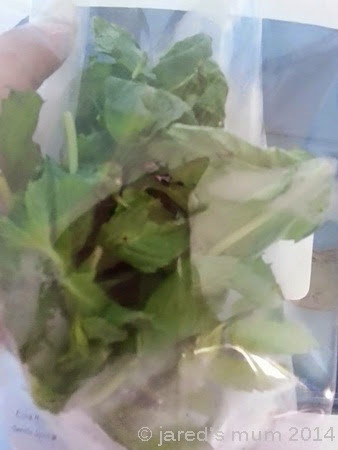 I will look for more ways to use mint in cooking and food preparation so I will know what to do with the leftover leaves. This entry was posted in food musings and tagged herbs, spices on 5.September.2014 by admin. One of my goals for the new year 2013 is to spend more time in the kitchen. I am no good in cooking and there were only too few dishes I can prepare, but since I also aim to eat healthy this year, and instill that habit on my little man, too, and curb on eating fast food, it only means I have to prepare more home-cooked meals. Am a miserable cook and every time is just hit-and-miss! That is why I really think spices are such god-sends. They work wonders in spicing up my dishes and my life! Late last year I started grabbing a spice bottle whenever I take a trip to the grocers, I am hoping to build up my spice collection this year, too! And even when I had to figure out how to use most of them on my dishes, I’d still agree that they are the perfect addition to my diminutive kitchen. Which spices are your favorite and why? This entry was posted in food musings and tagged spices on 12.January.2013 by admin.